Life was always happening in the garden and the barn. The summer heat, the winter wind, the spiders and their webs, the birds and their nests in every nook and cranny. While everyone else was moving from their temperature controlled house to their temperature controlled car to their temperature controlled office, I was slogging through spring mud or breaking the ice layer in water buckets or dripping sweat onto the tomato plants as I pruned them. I knew the minute slug season arrived, and tick season, and when the field mice abandoned the field for the greenhouse. Of course, I always retreated to my air conditioned house. And we all know about my love affair with the woodstove. Despite all my outdoor activities, I woke up in the mornings like everyone else–surprised when I peered out the window and discovered it had rained during the night, shocked when I opened the deck door to get the dog her breakfast and found a cold front had moved in and temperatures had dropped. I took shelter in a brick house that, as all good little piggies know, withstood weather and wildlife very easily. Now an RV is not tent camping by any means. But I do not need to peek out the window as my coffee brews to know the birds are at the feeder. I know, while still laying in bed, the minute the birds are awake for the day. And I know when the temperature changes during the night because I will end up either reaching for the afghan or kicking off my quilt. This is partially because fiberglass and laminate construction are not straw or sticks, but sure as heck aren’t brick either. But another part is that the RV is almost always open to the elements. Opening windows in a 2,000 + square foot house involved a ton of windows in a bunch of rooms, adjusting dual HVAC systems, and at least 2 trips up and down the staircase. Then all of that had to be repeated when the weather changed or we wanted to lock everything up for the night. Excluding the driver’s cab (which I keep closed off to the rest of the RV anyway), the RV has 3 windows, 3 ceiling vents, and a screen door. Basically, I can close or open up the entire rig on my way to the bathroom. Almost all mornings and nightimes have been cool enough for screens and a fan blowing in the kitchen and bedroom. Only the hot afternoon sun baking the RV roof or the days with relentless humidity were able to make it uncomfortable enough for closing windows and shades. Usually I was out of the RV in the afternoons and simply turned on the A/C while making dinner in order to cool things off as the sun went down. 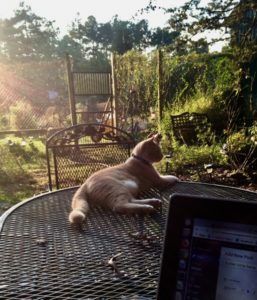 By bedtime it was back to open windows and the frogs peeping in the pond, the stars visible through the open ceiling vents, an occasional mosquito buzzing against the screen. When I finished mowing the lawn or weeding the garden and came in for a shower, I was still serenaded by the cardinal nesting in the climbing rose or the woodpecker trying out the dead trees around the pond edge. The large window that covers almost one entire side of the RV showed the minute the trees began to sway with the approach of an oncoming storm and there was no way even the slightest drizzle could be missed, tapping away on the RV roof. Because that is what the RV reminds me. That the sweltering heat passes. That the birds will quiet soon after sunset and the frog chorus will end before dawn. That the thunderstorm crashing directly over head, leaving me with 2 terrified catten earmuffs, will move away, as I lay there counting the seconds between lightning and thunder like I did as child. That a chilly night can be managed with a fleece blanket tucked under the chin. Because it will be warm again. The RV has blurred all the lines between inside and outside–the garden and the pond and the woods are like other rooms in my home. All of nature, from the ants that for some odd reason have cut a busy trail right across my gravel pad to the raccoon and opossum that alternate checking my trash can and compost pile each night to the the wild hickory tree that drops its nuts like tiny grenades onto my roof, are my neighbors. Before it always seemed like a to hassle to write on the deck up at the house. 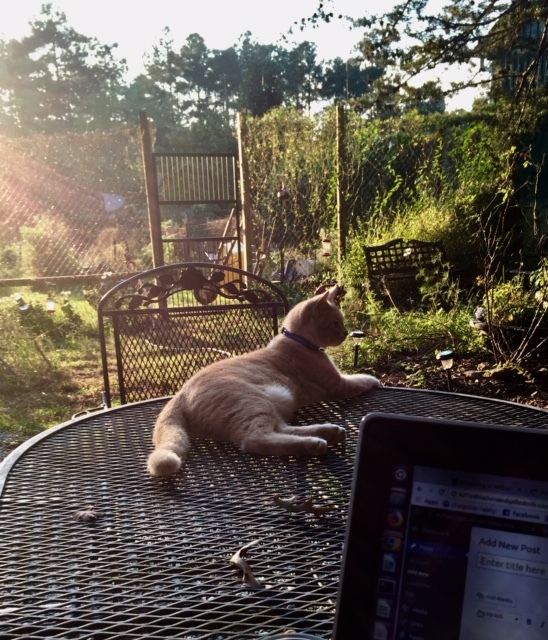 Now I just grab the laptop, take a few steps out of the RV to the patio furniture and write away, overlooking the garden as the flitting wrens change to squeaking bats, the Rose of Sharon closes and the Moonflower opens. The fall garden is a mess, of course. Honeysuckle has climbed into the cardinal vine. The tomato plants are dried husks. The water fountain is clogged up with parrot feather run amok. Even the zinnias are liver-spotted and sagging (I hear ya). It would be stressful to look at if it wasn’t still humming with life, critters of all kinds foraging and feasting before frost shuts down the show. And when that frost arrives, the days will be perfect for toiling in the garden and the withered greenery will give way with the slightest of tugs. “It will be cold again,” I remind Zach the catten. I reminded myself that when it was 20 degrees at night I’d be wistful over hot summer nights. I thought of all the pleasant things I associated with heat—sunbathing on a pool floaty, hiking in Saguaro National Park, sweaty and itchy on the lawn as fireworks explode on Fourth of July. That didn’t help. So I summoned the way my fingers were reddened and raw with cold when carrying slushy buckets of water in January. The freezing sting that time I got caught in rain changing to sleet as I hurried up the driveway with the mail. The first frigid blast of air out of the car vents before the engine has warmed up. It didn’t help. 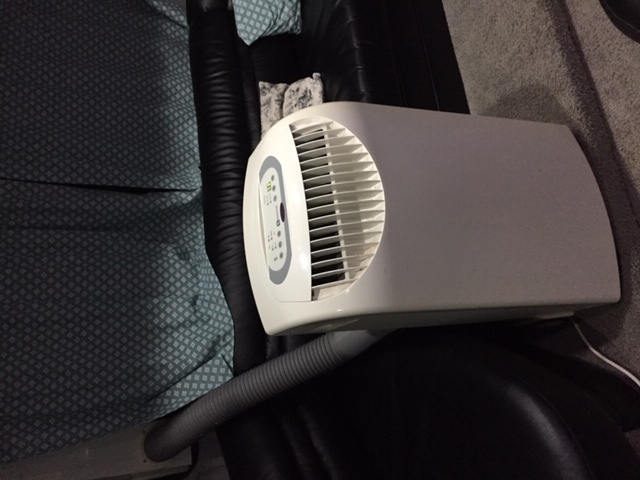 I scheduled an RV A/C repair, which quickly got complicated and started to drag out. 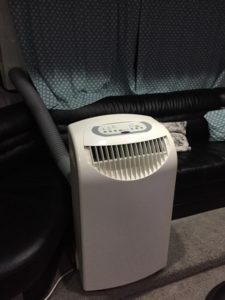 Luckily, while I was borrowing my parents’ car because my car was in the shop, they mentioned I could borrow their portable air conditioning unit if I wanted it. I’m nut sure why I was surprised that they had a portable air conditioning unit hidden away neatly in their shed. Having been parents for more than 45 years they appear to have survived every family emergency possible and retained all the accoutrements to do it again. Which is soothing and alarming at the same time. Because am I supposed to take over this organized aptitude at some point and time? If so is it going to be a long, long, long time away from now? It better be or my kids are going to be sorely disappointed…. Anyway, I rearranged the RV living room a bit and got everything set up. The temperature was down to a pleasant 70 degrees by bedtime. I told you so. Still me. And it will be cold again. Oh, yes it will.